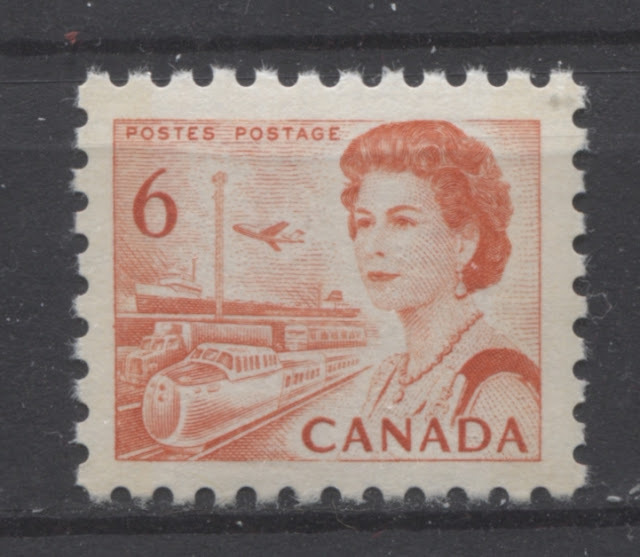 Today's post will get into the remaining printings of the sheet stamps of the 6c orange transportation design. This is an interesting stamp because it proved to be wholly unsuitable for the mail sorting machines that the post office was introducing. 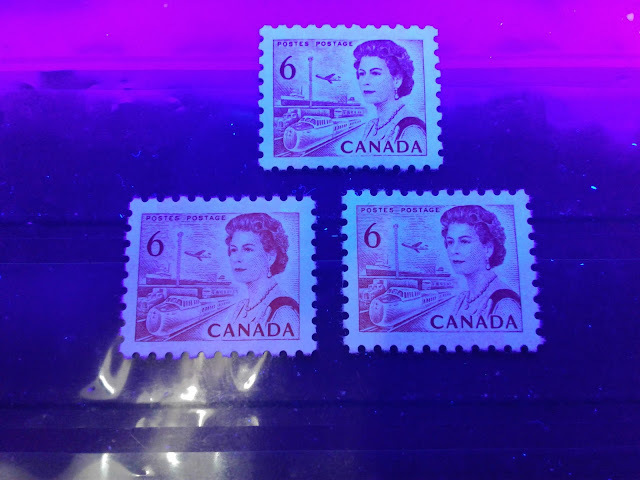 Collectors who spend a significant amount of time with this issue will note that the Winnipeg tagging is often very difficult to see on these stamps, even under UV light. This is one of the reasons why the orange colour was dropped and replaced with black in early 1970. Last week I looked at the very first printings of the sheet stamps, which were comb perforated 10. This week, I will explore the later printings of the untagged stamps, which were comb perforated 12.5 x 12, and the tagged stamps that were issued in both perforations. Unlike the perf. 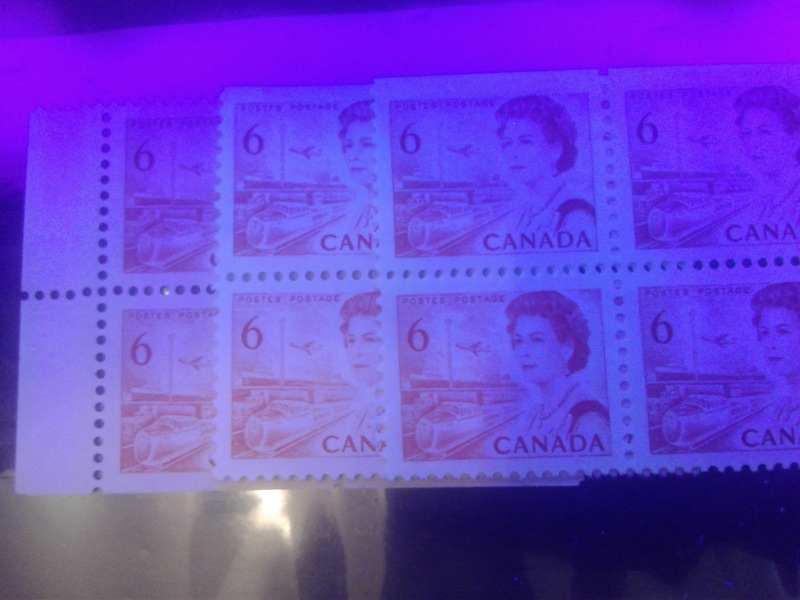 10 stamps that I looked at last week, there are no known fluorescent orange ink varieties known on either the perf. 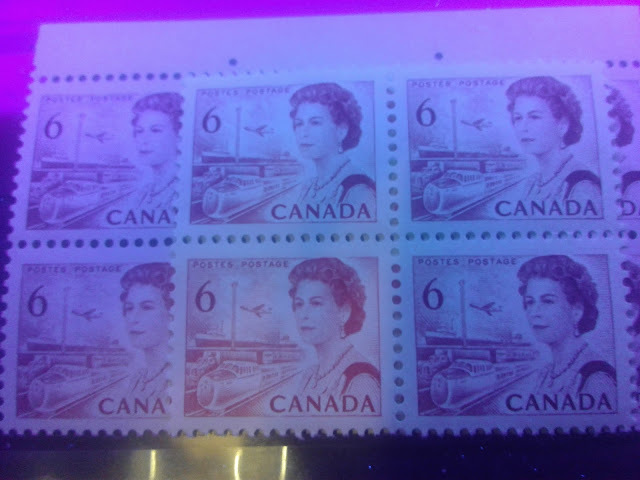 12.5 x 12 untagged stamps, or the Winnipeg tagged stamps. However, the rarest of all Centennial regular issue stamps is to be found among this group of printings: the hibrite paper perf. 12.5 x 12 with Winnipeg tagging. Fewer than 100 mint and 100 used examples of this stamp are known according to Unitrade. I once found three used examples in a large box lot of used Centennial stamps 15 years ago. But I have never seen any since. They are exceptionally rare, and consequently, I do not have an actual example to show here. But I will discuss it. A smooth, cream coloured wove that appears distinctly off-white when viewed against a stark white background. 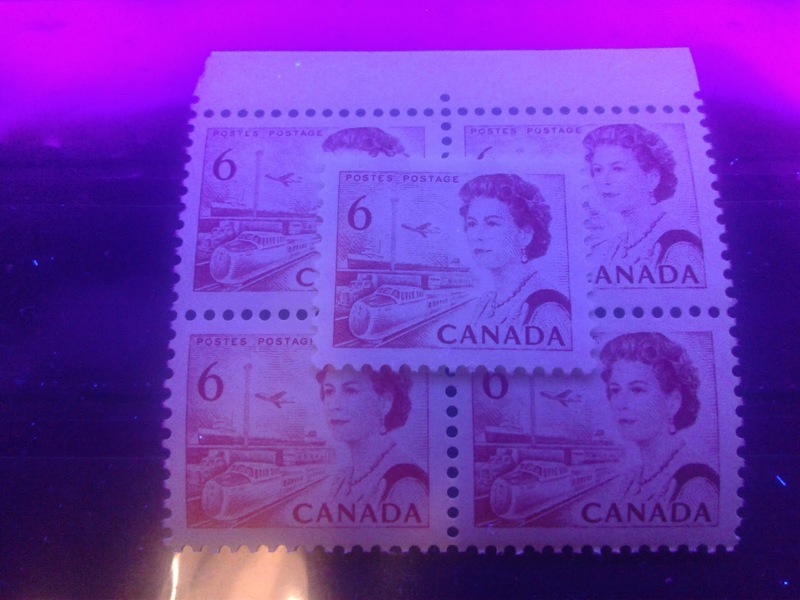 There is no visible surface ribbing on this paper, even when the stamps on it are viewed at an angle to the light source. The printing surface is very smooth and appears to have a very light coating, which prevents the surface fibres from coming loose. When held up and viewed against strong back lighting, stamps on this paper will show a faint vertical mesh pattern in the paper. A similar paper to the above, except that when viewed against strong back lighting, the mesh pattern appears horizontal, rather than vertical. A cream coloured wove paper that shows light vertical ribbing on the printing surface. 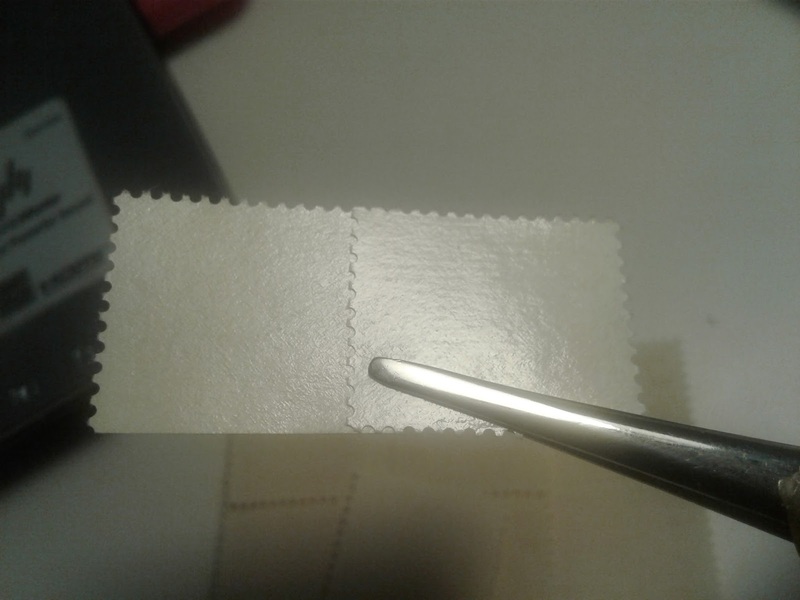 This ribbing can be quite obvious, or it may be quite hard to see, until the stamps printed on this type of paper are viewed at an angle to the light source, where the ribbing become more visible. The mesh pattern is very distinct, when the stamps are held up to a strong back light. The same as (3) above, except that the paper colour is slightly whiter in normal light. This is the hibrite paper. The above picture shows two blocks and a pair stacked on top of the second block. The left block is the non-fluorescent paper, and you should be able to see that it appears violet grey under UV light. The second block is the ivory version of the dull fluorescent paper, while the top pair is the low fluorescent flecked paper. 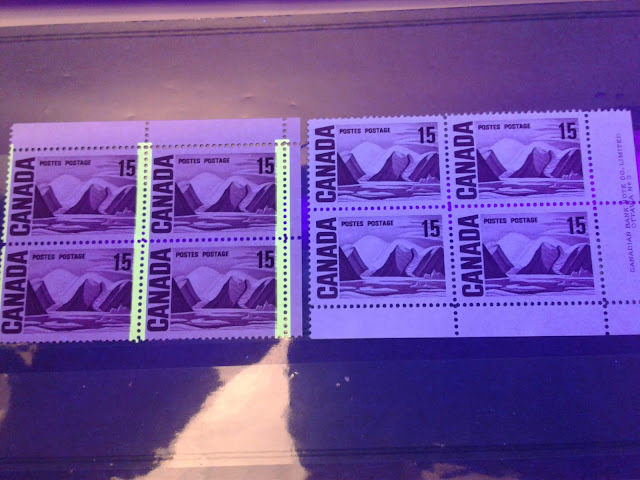 You can see the difference between the dull fluorescent and low fluorescent paper if you compare the top pair with the stamps on the right side of the picture, which below to the dull fluorescent block. As you can see, the low fluorescent paper is much brighter than the dull fluorescent paper, even if it is not bright in its own right. The block on the bottom appears violet grey under UV light, while the top pair is a grey colour without the violet undertone. 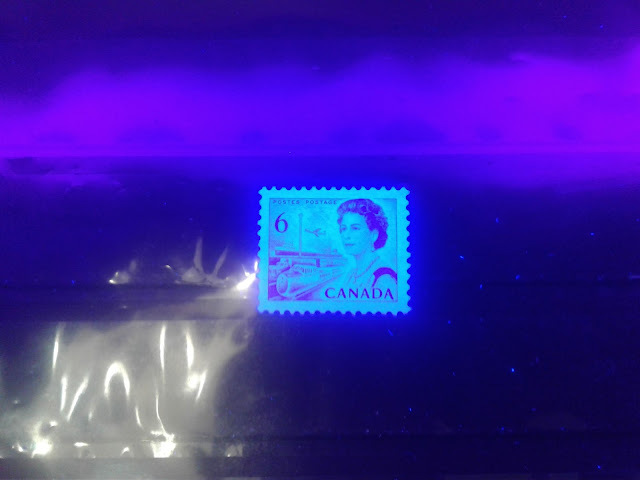 The larger block of 6 stamps, which is protruding from the left side of the picture is deep grey under the UV light, while the top block is an ivory colour under the UV light. 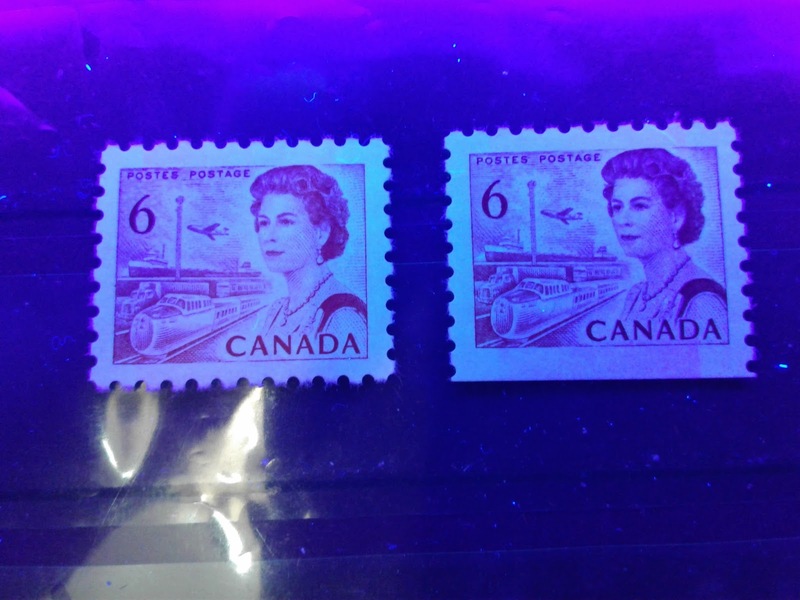 In this picture, the stamp and the block appear to be the exact same colour under UV. In reality though, the top stamp contains a violet undertone to the grey colour in which the stamp paper appears. The bottom block is a similar grey to the larger block shown previously, but the grey colour of the paper for this block is slightly lighter. Once again, neither the non-fluorescent papers, nor the dull fluorescent papers contain any fluorescent fibres. The blocks on the left and centre are both a brighter violet grey under UV, and contain very few medium fluorescent fibres and 1-2 hibrite fibres. The left block is just a bit brighter than the block at the centre. The right pair is a greyish white colour under UV, and contains a very sparse concentration of low fluorescent fibres. This is one of the few so called hibrite papers that is actually a true hibrite. It is a very bright bluish white colour, with no mottling at all. There are several shades of the red-orange ink used to print these stamps, despite no shades being listed by Unitrade. Generally there is more red in the perf. 12.5 x 12 stamps as compared to the perf. 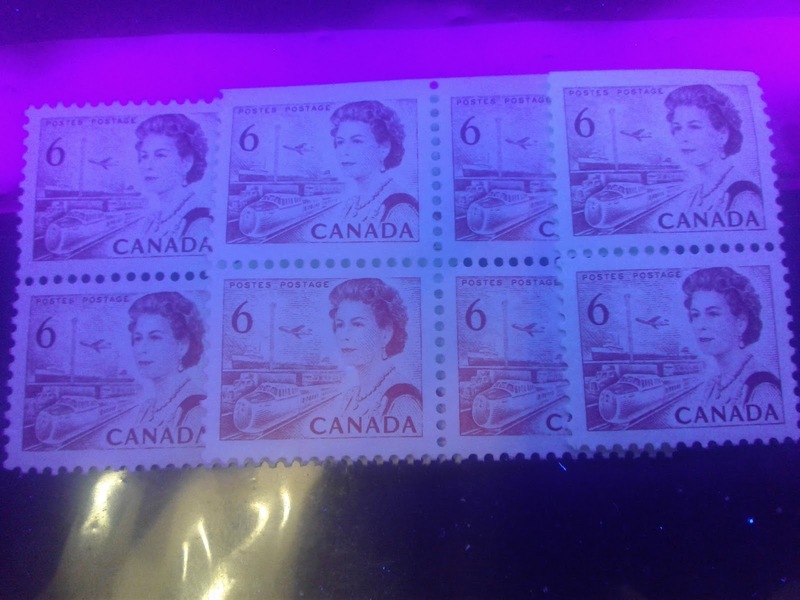 10 stamps, or the colour is often duller. The block on the right side is a dull red orange, while the block on the left is a pale bright red orange. Under UV light, both of these blocks appear red orange. The block of six is printed in a very similar shade to the pale bright red-orange above. The only difference is that the ink on this block is not quite as bright as the pale bright red-orange. So I would call it simply the pale red-orange. The block on the right is a deep dull red-orange shade. These shades appear deep orange under UV light, but do not appear to be especially reddish. This shade is found on the hibrite paper, though I would expect that it exists on all the other paper types also. Under UV light, the ink almost appears black. Thus it is an example of a transformative ink. The pair on the right is the red-orange, while the block on the right simply appears deep orange. A smooth cream gum that has a semi-gloss sheen, a slight bit of cracklyness to the surface, ad no streaks or brushstrokes visible in the gum. A smooth cream gum that has a semi-gloss sheen, but appears to have horizontal brushstrokes in the gum. You can see that the two gum types are completely different in terms of their overall appearance. As stated in the heading of this section, these stamps were comb perforated 12.5 x 12. I have not found any variation at all in the perforation. Over 100 minor flaws, most of which are constant, are recorded on this design. Most all of them consist of stray specks and dots in various parts of the design, and the margins. I will illustrate these in a separate post as I come across them. All of the perf. 12.5 x 12 stamps were printed from plate 3 only. In addition, the panes were guillotined in the manner described for the perf. 10 tagged stamps, so that in addition to 4 different plate 3 inscription blocks, it is also possible to collect 20 different blank corner blocks of any given variety. For the non-hibrite paper, I identified three paper types, 9 levels of fluorescence, 5 shades and two types of gum. Thus, it is possible that there could be up to 3 x 9 x 5 x 2 = 270 different collectible stamps, 1,080 different plate 3 blocks and 5,400 collectible corner blocks. At the moment, the hibrite stamps seem to exist in only 1 paper, one gum type and 1 shade. So there are really only 4 plate 3 blocks and 20 blank corner blocks possible, though there could be shade variations that I have simply not seen, since I only have a few examples of the hibrite paper in stock. The paper used to print these stamps is a horizontal cream wove paper, that appears to be a light cream colour when viewed against a stark white background. The printing surface of the paper is smooth, but uncoated and porous. There are no loose fibres visible on the paper surface. There is also no ribbing visible on the paper surface, but if you hold a stamp up to a strong back light, you can just see a very faint vertical mesh pattern in the paper. There are other instances in which the mesh pattern is very clear in back light as well. The top stamp appears a very light bluish grey under UV light. 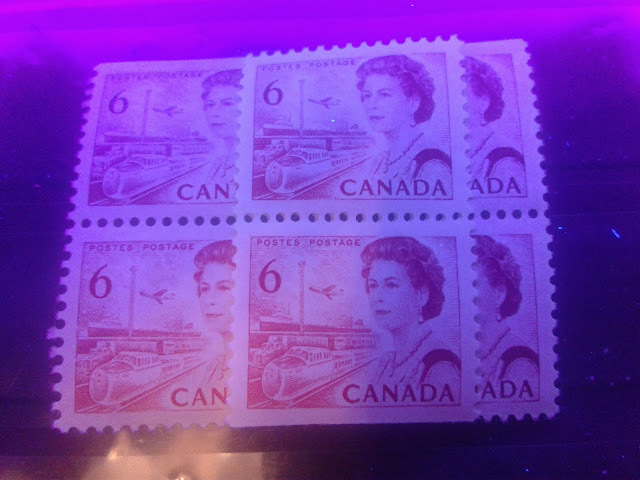 The bottom left stamp appears grey under UV light. The bottom right stamp appears greyish white under UV light. None of the three papers show any visible fluorescent fibres. The above picture shows two basic differences in the appearance of the orange ink under UV light. The bottom left stamp appears the exact same bright red-orange shade under UV, that it appears in normal light. The other two stamps appear a much deeper orange, that lacks the brightness, and the reddish tone that appears in normal light. 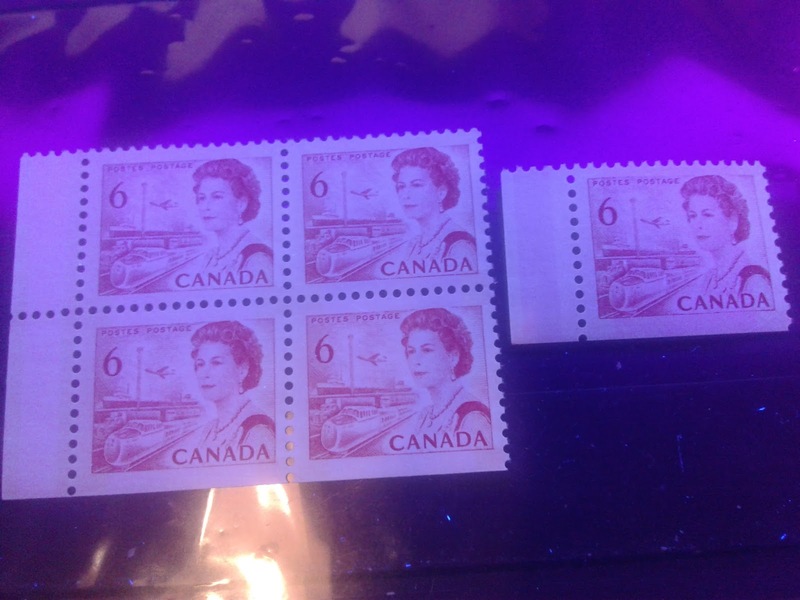 I would still classify these inks as non-transformative because the basic colour of the stamps under UV light is still orange. A smooth cream gum that shows no cracks, has a semi-gloss sheen, and shows what appear to be very light horizontal brush strokes. A smooth cream gum that has a satin sheen and shows a very fine diagonal crack pattern. As stated in the title, these stamps were all comb perforated exactly 10. I have not found any variations at all in the perforation. The bars on the left stamp are almost completely invisible. You have to look at the upper left and upper right corners of the stamp to see them. If you look carefully, you can see a line in the margin where the paper in the middle appears more greyish than the paper at the very ends of the stamp. These slightly brighter areas are the tagging bars. The right stamp shows the tagging bars a little more clearly, particularly at the lower right of the right stamp. Here, you should be able to see a clear vertical line in the lower margin at right, and then again at left. These are the tagging bars. 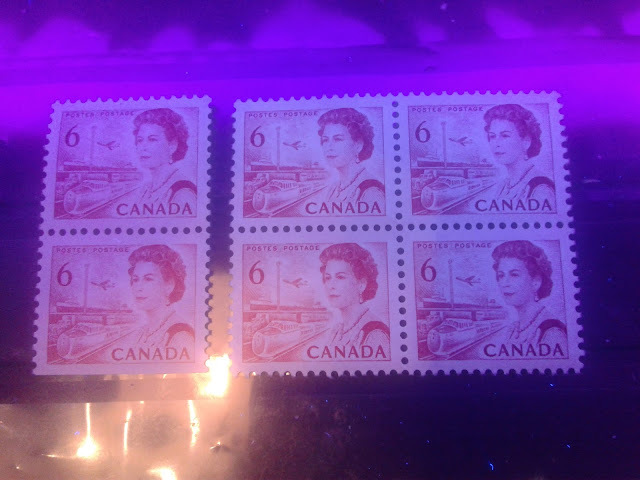 Unlike the Winnipeg tagging found on the other stamps of this series that were printed by the CBN, there is little to no afterglow visible after the UV light is switched off. Consequently, these are very easy stamps to overlook. The tagged panes were all trimmed, so the only way that blocks can be collected, is as blank corner blocks. Unlike the CBN that perforated the panes on all sides and then guillotined them apart, the BABN did not perforate the panes where they were to be guillotined, so that many blocks have straight edges on two sides. This means that rather than 12 possible collectible positions, based on selvage widths, there are up to 20 collectible blocks in each sheet layout with these stamps. If we completely ignore the plate flaws, there are up to 6 different papers (each of three types of dull fluorescence, and faint or clear vertical mesh), two different ink types and two gum types. Thus there are potentially 24 different types of collectible stamps and 480 collectible corner blocks. The papers used to print these stamps are the same as those found on the untagged stamps in this perforation. The block on the left is the paper giving a violet grey reaction under UV, while the block in the middle is the ivory paper. Finally, the block on the right is the greyish white paper under UV light. The block on the left is the dull fluorescent grey paper, while the low fluorescent blocks are shown in the middle and right. The middle block is a brighter greyish white colour under UV, and contains no fluorescent fibres, while the block on the right is a lighter violet grey that contains a very sparse concentration of medium fluorescent fibres. Not surprisingly, this stamp is found in more or less the exact same range of shades as the untagged stamps. So, there should be at least five shades of the red-orange ink. As was the case with the untagged stamps, these are comb perforated 12.5 x 12. I have not ever found any variation in the perforation. As was the case with the perf. 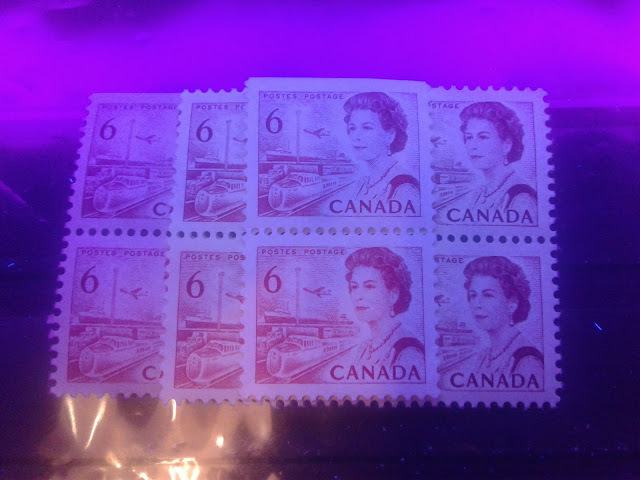 10 stamps, the Winnipeg tagging is usually quite difficult to see under UV light. 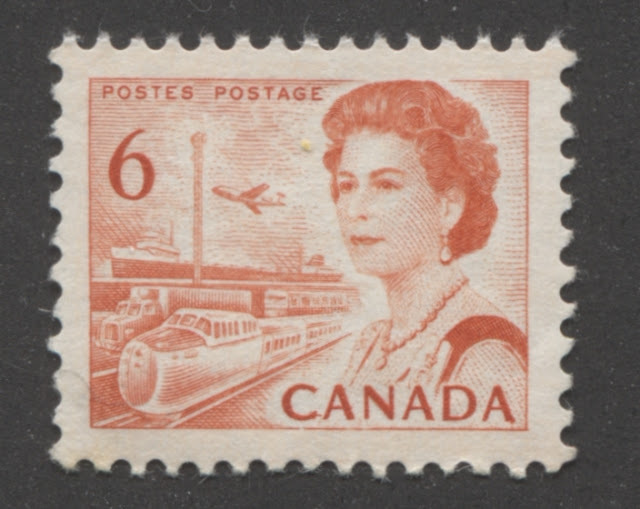 In most cases the tagged parts of the stamp appear darker in colour, rather than lighter, which is the opposite of what we usually see with Winnipeg tagging. However, in some instances, one can find examples tagged using bands that appear a light bluish white, and are lighter than the rest of the stamp. There was an experimental type of taggant that was in use, which gave a bright yellowish white tag. Unfortunately, I do not have an example of it to show here, but will add an image as soon as I find one. On the left block, the tagging makes the stamp appear darker on the tagged areas. On the right single, the tagging bars show lines that are slightly brighter than the rest of the stamp. The block on the right shows the normal tagging, which is very light and difficult to see, unless you are looking closely and carefully at the block. The block on the left shoes much darker tagging, that is quite obvious to the naked eye. Again, as with all Winnipeg tagged stamps, there are no inscription blocks, and up to 20 different blank corner blocks. With these stamps there are 3 different paper types, 9 levels of fluorescence, 5 shades, three types of gum, and at least three types of tagging. So there are potentially, 3 x 9 x 5 x 3 x 3 = 1,215 different collectible single stamps and 24,300 possible corner blocks. This brings us to the end of the sheet stamps of the 6c orange. Next week, I will look at the coil stamps and the booklet stamps of this colour. 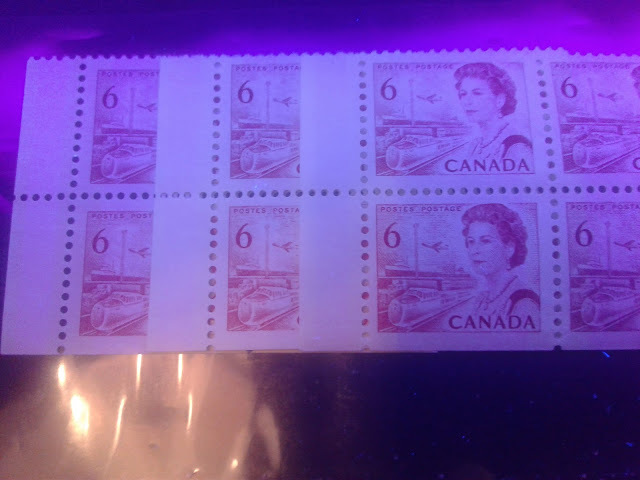 The following week after, I will begin looking at the sheet stamps of the 6c black of the same design. Our website is now online and open for business. At present, there are only a modest number of stamps listed, but over the next 8-10 weeks, I will be transferring some 6,000 stamps from my E-bay store to the website. So lots of new items will be appearing continuously. After this is done, I will continue listing items until all my inventory is listed, which I expect will be about 2 years. When it is finished, this will be one of the largest, if not the largest online retail source of Canadian stamps in the world. By catalogue number - both Unitrade and Stanley Gibbons. By lot type - single stamps, FDC's Covers, Cancels, complete sets, year sets and revenues. When the inventory is all listed, it should be possible to browse practically anything you want without having to look through more than 2 or 3 pages of results at a time. Of course, you will still have the search function to fall back on, but the difference is you don't have to use it. You can just casually shop your favourite category or issue. Orders between $10-$20 USD: 10%. Orders between $20-$50 USD: 15%. Orders between $50-$100 USD: 20%. Orders over $100 USD: 25%.